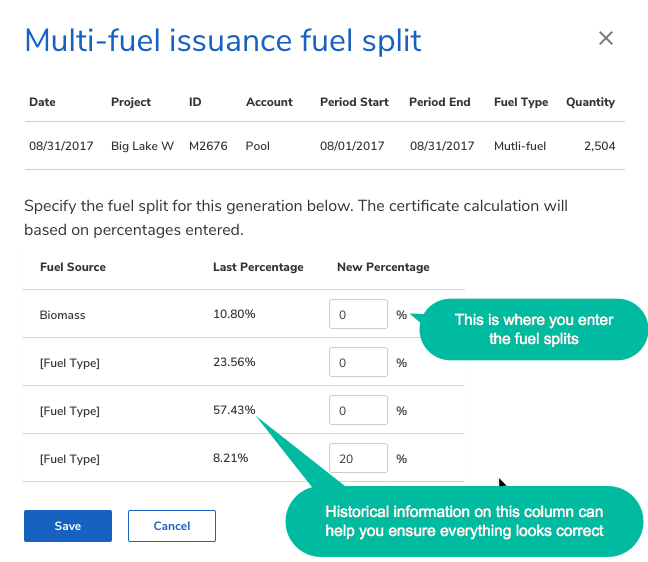 There are two ways to access the multi-fuel issuance fuel split screen. You can enter the interface to update fuel splits by clicking on Update Fuel Split in the Dashboard notice. This notice will appear until you click X or go in to update the fuel split. 2. You can also access this interface by going to the RECs tab and clicking on Transaction History and then clicking on each transaction listed in the Pending Transactions box that has a Fuel Split notification next to the quantity. Below is the interface that you will use to enter the fuel split information. Certificates will only be issued for fuels deemed renewable by the M-RETS Operating Procedures.